TSOP 17…. Series Photomodules are miniature IR sensor modules with PIN photodiode and a preamplifier stage enclosed in an epoxy case. Its output is active low and gives +5 V when off. The demodulated output can be directly decoded by a microprocessor. The important features of the module includes internal filter for PCM frequency, TTL and CMOS compatibility, low power consumption (5 volt and 5 mA), immunity against ambient light, noise protection etc. The added features are continuous data transmission up to2400 bps and suitable burst length of 10 cycles per burst. The photo module has a circuitry inside for amplifying the coded pulses from the IR transmitter. The front end of the circuit has a PIN photodiode and the input signal is passed into an Automatic Gain Control (AGC) stage from which the signal passes into a Band pass filter and finally into a demodulator. The demodulated output drives an NPN transistor. The collector of this transistor forms the output at pin3 of the module. Output remains high giving + 5 V in the standby state and sinks current when the PIN photodiode receives the modulated IR signals. Photomodules are 3 pin devices. 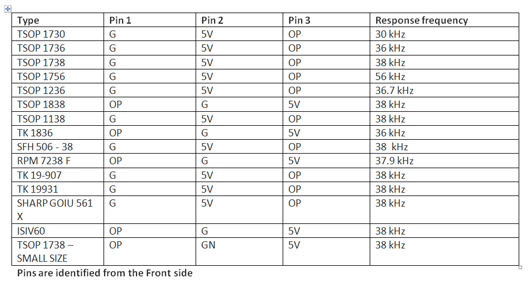 These pins are assigned for +V ( 5V ), –V ( G) and Output( OP ). The pin assignment of TSOP 17… series from the front side (projected side) is Pin 1 Ground, Pin 2 + 5V and pin 3 Output. The photo module requires regulated 5V supply. If the supply voltage increases, the device will be destroyed. For the proper functioning of the Photo module, it is necessary to consider some important aspects. 2. 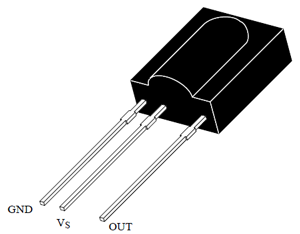 A 100 uF capacitor should be connected to the +V pin as a buffer and filter capacitor. This will suppress the power supply disturbances. 3. Carrier frequency should be close to the center frequency of the band pass filter. 38 kHz in the case of TSOP 1738. 4. Burst length must be 10 cycles per burst or more. 5. Between each 10 to 70 cycles, a gap time of 14 cycles is necessary to reset the module. 6. DC lights such as tungsten bulb and daylight affects the functioning of the photo module. 7. Signals from Fluorescent lamps with electronic ballast will affect the working of the photo module. 8. Continuous IR signal (non- pulsed) will disturb the photo module and it will not responds to it.